Cardamom is one of the unsung heroes of the spice world, offering big flavor and bigger health benefits – and yet staying largely out of the average Western kitchen. Cardamom may share familiar beginnings with several other spices, but its history of global use is anything but common, following a trajectory all its own and garnering culinary as well as medicinal esteem along the way. Now native to several tropical regions of Southeast Asia, cardamom is thought to have originated in southern India and Sri Lanka, finding use in traditional Ayurvedic medicine as far back as 4,000 years ago. Improves oral health. The use of cardamom can improve many aspects of oral health, including fighting gum disease and tooth decay, as well as eliminating bad breath. Eases indigestion. Cardamom is incredibly useful for easing heartburn or upset stomachs. Lowering blood pressure. Cardamom encourages antihypertensive activity in the body, which can help lower blood pressure. Reducing inflammation. Its anti-inflammatory properties can ease muscle and joint pain in the body. Treating depression. While there is no scientific evidence to support this function, cardamom has been used to treat depression. Cardamom has numerous chemical compounds that give it its exceptional medicinal properties. 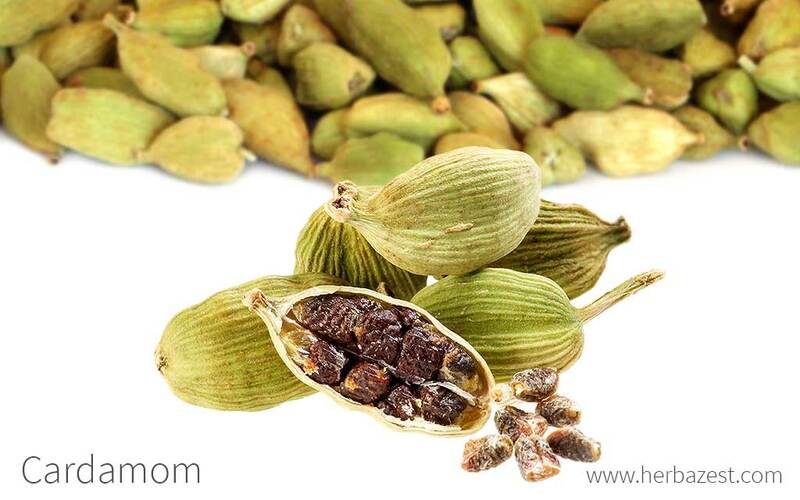 Elattria cardamom seeds are rich in volatile oil, which mainly includes phenolic and flavonoid components. Some of these components include starch, protein, waxes and sterols. These compounds, along with its high methanol content, give cardamom its gastroprotective properties, which ease digestive issues. Cineole, one of the major components found in cardamom oil, is a potent antibacterial and antiseptic used in the treatment and prevention of bad breath and gum disease. It fights oral pathogenic bacteria, which can lead to halitosis and oral infections. Antiseptic properties are also present in calendula and stevia, whereas oregano and peppermint aid digestion. Cardamom is likely safe for most people when taken by mouth. However, very little research has been done regarding its potential side effects. For those who suffer from irritable bowel syndrome (IBS) or other stomach sensitivities, large amounts of cardamom can trigger an upset stomach. Individuals with gallstones should not take cardamom because it can trigger gallstone colics. Likewise, women who are pregnant or breastfeeding should consult a physician before taken cardamom medicinally since little is known about its potential effects. The most effective way of obtaining cardamom's health benefits is in its medicinal forms of consumption, where the properties are more concentrated. Dried. Two types of dried cardamom are used for food: black cardamom and green cardamom. Both kinds of cardamom seeds are considered a spice, like ginger, and they can be added to savory and sweet dishes, not just for flavor, but also to aid digestion issues, such as diarrhea or nausea. Infusion. When brewed into a hot tea, cardamom eases stomach complains and lower blood pressure. Essential oil. Cardamom essential oil has numerous medicinal properties, including easing heartburn and reducing inflammation in the muscles and joints. Extract. In this medicinal form, cardamom extracts are incredibly beneficial for easing an upset stomach. Tincture. When taken as a tincture, cardamom can improve oral health by eliminating halitosis, which causes bad breath. A tropical plant by nature, those living in temperate climates may have trouble finding full-sized plants, but raw seeds and teabags that feature the spice can be found year-round in many ethnic markets and some specialized health food stores. Cardamom powder, in contrast, is a far more common sight in grocery stores and supermarkets around the world. Supplements of cardamom are still somewhat rare outside of Asia, though they do exist, and they come overwhelmingly as an essential oil or in extract form. The widest variety of brands and concentrations can be found through online retailers thanks to globalized shipping and the medium's ability to cater to specific markets. Because it is a high maintenance tree, growing cardamom is not recommended for novice gardeners. For those who take on the challenge, however, it can be incredibly rewarding. Follow the growing guidelines below for this tree. In order to thrive, cardamom requires an average temperature of least 72°F (22°C) and high humidity. It prefers rich, slightly-acidic, loamy soils. For best growing results, fertilize with phosphorus or potassium in the soil. Cardamom is highly intolerant of drought, so a steady water supply is required at all times if it does not rain often. Cardamom needs at least partial sunlight in order to grow. The cardamom plant produce capsules that contain seeds in its third year of life. After the flowers mature, they will dry out as capsules develop. Cardamom can reach heights up to 10 feet (3 m) by its third year. Native to India and other parts of central Asia, cardamom is recognized for its small seed pods that can be green or dark brown to black, triangular in cross-section and spindle-shaped, with a thin, papery outer shell and small dark seeds. Individual cardamom plants can grow up to 15 feet (5 m) tall, and their characteristic blooms are white with reddish-purple markings. Leave are long, pinnate, and lance-shaped, while seeds are grown in seedpods along the stem. Up to 20 seeds - the part that contains the highest concentration of the herb's nutritional value - can grow from each pod. Cardamom (Elettaria cardamomum) is one of 1,300 species that belong to the Zingiberaceae family, which is known for flowering perennial plants with tuberous roots and rhizomes. Other well-known members of this family, closely related to cardamom, are ginger (Zingiber officinale) and turmeric (Curcuma longa). The genus Elettaria consists of about six or seven species distributed in India, Sri Lanka, Malaysia, and Indonesia. However, E. cardamomum is the only one with economic value. In the wild, Malabar cardamom plants, native to the Kerala region of India, feature clusters of flowers that grow horizontally along the ground. This is their main difference from the Mysore cardamom variety, whose flower clusters grow vertically. In regard to cardamon cultivars, the hybrid union of Malabar and Mysore is known as 'Vazhuka', whose traits fall predictably between the extremes. On a commercial level, modified cultivars like 'Njallani' offer the highest yield per crop cycle. Cardamom was listed in ancient Egyptian documents as a cure for overindulgence as early as 1500 BCE. Ancient Greece and Rome incorporated it into perfumes and ointments for the duration of each civilization, and Vikings who later came to Constantinople brought it back to Scandinavia as a seasoning. Despite such early expansion, cardamom was not introduced to North America until the 19th century, but by the 1920s, cultivation in Guatemala surpassed every worldwide precedent. Though not as commercially prominent as other plants, cardamom still forms a significant part of the spice industry, most commonly exported for culinary use. Guatemala has led production for the past 80 years, generating a net crop of almost 24,000 tons of nutmeg, mace, and cardamom in 2011 alone and surpassing production quantities of even coffee, its best-known resource. India also continues to be a strong producer, having yielded roughly 16,500 tons in the same year. Bulk green cardamom creates the most profit, selling from India at an average of $9.00 USD per kilogram. In Saudi Arabia, cardamom was believed to be an aphrodisiac. It was also believed that by blending cardamom into coffee, the cardamom would eliminate of the bad effects of drinking coffee. Cardamom carries symbolic meanings in Hindu worship. In Cambodia, east of Angkor Wat, lies the Prasat Krawan temple, also known as the Cardamom Sanctuary. It is dedicated to Vishnu, one of the central deities of Hinduism. Perfume industry. Cardamom essential oil is commonly used in fragrances, as its scent provides a rich undertone to many other popular ingredients, such as myrrh or sandalwood. Breath refresher. Cardamom flavoring is used as an additive for breath mints, chewing gums, and other products aimed at neutralizing bad breath.